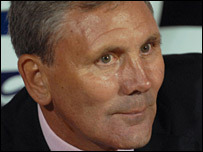 Sunderland legend Ian Porterfield has died, aged 61. Porterfield, who scored the Black Cats' winning goal against Leeds United in the 1973 FA Cup final, had been suffering from cancer. Born in Dunfermline, Porterfield also enjoyed a successful management career with Rotherham, Sheffield United, Aberdeen, Reading and Chelsea. He went on to coach in Korea and took charge of several national teams, and his final job was as boss of Armenia. Porterfield was in charge of Armenia for their superb 1-1 draw against Portugal in Yerevan on 22 August which left Luiz Felipe Scolari's superstars facing a fight to qualify for the European Championship finals in Austria and Switzerland next summer. Porterfield's widow Glenda said: "He may have been a football man all his life, but I know him best as a wonderful human being who was liked by everyone he came in contact with. "He had his wish to die in harness. Just over two weeks ago, we flew to Armenia for the Portugal game and I'll always remember what happened at the open training session at the stadium on the day before the game. "The stadium was packed to see all the Portuguese stars like Ronaldo, Deco and the rest, but when Ian walked out, they all stood up and shouted his name. It was very moving." Porterfield replaced Sir Alex Ferguson at Aberdeen following his compatriot's departure for Manchester United in 1986 and the United boss said: "His death so young is a tragedy for his family and for football. "It isn't long ago when he was coaching in Korea that I spoke with him with the intention of getting a few young players over to United. "I played against him when he was with Raith Rovers. He was an exceptional footballer, blessed with a lot of natural talent." Sunderland chairman Niall Quinn told the club's website: "It is a very, very sad day for the football club and of course our immediate thoughts are with Ian's wife Glenda and his family during what is a tremendously difficult time. "The word legend can be very much over-used in the modern era of football, but Ian is what I would call a true legend of the game. "He is part of what can only be described as an institution in the long and proud history of Sunderland AFC - the famous FA Cup-winning team of 1973. "His appearances for the club during 10 loyal years at Roker Park, not to mention his winning goal at Wembley, also ensure that his name is up there with the likes of Charlie Hurley, Raich Carter and Bobby Gurney." Sunderland's next match in the Premier League at the Stadium of Light is against Reading - who Porterfield managed for 20 months until February 1991.